... an army of one. As The Outlaw Josey Wales, five-time Academy Award winner* Clint Eastwood is ideally cast as a hard-hitting, fast-drawing loner, recalling his “Man with No Name” from his European Westerns. 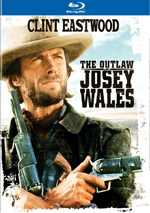 But unlike that other mythic outlaw, Josey Wales has a name – and a heart. After avenging his family’s brutal murder, Wales is on the lam, pursued by a pack of killers. He travels alone, but a ragtag group of outcasts (including Sondra Locke and Chief Dan George) is drawn to him – and Wales can’t leave his motley surrogate family unprotected. Eastwood’s skills behind and in front of the camera connected with audiences for its humor and tenderness as well as its hair-trigger action. For Clint Eastwood, 1976’s The Outlaw Josey Wales acted as a swan song of sorts. Starting with his role on the Rawhide TV series in 1959 and progressing through the mid-1960s “Man With No Name” films, Eastwood became best known for his westerns. Wales marked the end of this run, though; he’d make more westerns, but they’d become much fewer and far between. 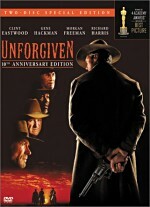 And they’d cease entirely with 1992’s Unforgiven, which capped Eastwood’s western career in a big way. Set toward the end of the Civil War, Josey Wales (Eastwood) lives as a Missouri farmer with his wife (Cissy Wellman) and son (Kyle Eastwood). One day Union “Red Leg” soldiers kill his wife and kid and torch his house. Needless to say, this doesn’t sit well with Wales, and when a band of Confederates led by Fletcher (John Vernon) tells him that plan to “set things right”, Wales decides to go with them. After a mix of violent excursions – and the end of the war - most of the renegade Confederates turn themselves in to obtain amnesty from the victorious side. Wales declines, which turns out to be a good decision: led by Senator Lane (Frank Schofield) and Redleg leader Captain Terrill (Bill McKinney), the “amnesty” is just a ploy to bring in the Rebels and kill them. Wales attempts to come to the rescue, but he can't do much to stop the massacre. Along with young Jamie (Sam Bottoms), Wales escapes and goes on the lam. Unfairly implicated in the mayhem, Fletcher is forced to go after Wales and attempt to kill him. This sets off a pursuit and a series of adventures. For all intents and purposes, Eastwood plays the Man With No Name here. Wales works from a more personal place due to his desire for revenge, but that doesn’t become a dominant theme in the character. Instead, Wales remains as laconic and biting as the earlier role; this is cool, hard tough guy territory. While I might fear Eastwood would veer into self-parody, Wales actually works just fine. One could see him as the bridge between the Man With No Name and Unforgiven’s William Munny; though he lacks the latter’s strong sense of regret, he shows more of a moral compass than the former and demonstrates a move toward the man who’s forced into violence by circumstances. Unforgiven offers the more “serious” western, though; Wales enjoys some decent thematic depth at times, but it mostly exists as an adventure. And a pretty good one, I must say. Does the film boast a particularly strong narrative? Nope – the movie mainly follows an episodic structure in which Wales travels about, meets new people, and encounters danger. This all connects to the main plot, of course – he is a man on the run – but it doesn’t exactly deliver a memorable story. I don’t mind, however, because Eastwood – who also directed the flick – keeps the tale going well. Wales moves at a nice pace and balances character moments/development with action in a satisfying way. Eastwood never leans too far in one direction, so we don’t become frustrated. We know enough about the various roles to care, but Eastwood realizes that we want some fighting and makes sure we get plenty of that as well. One shouldn’t expect rootin’-tootin’ shootin’, though. While not as downbeat as Unforgiven, Wales definitely foreshadows that movie’s view of violence. In Wales, we rarely see anyone as especially heroic when they kill or wound; some moments lean toward laughs, but usually the film depicts violence with a tinge of regret. Even when Wales tracks down the worst offenders, he shows no joy in his revenge. That lends the film a layer of depth unusual for the time, and it gives the movie a darkness that benefits it. 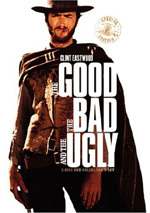 Not that one can’t find fun in Wales, as Eastwood doesn’t make it some kind of Greek tragedy. Even with all the drama and angst, he peppers in quite a lot of subtle humor, and warmth pervades the movie as well, especially via Wales’ relationship with Indian Lone Watie (Chief Dan George). I really like the chemistry between Eastwood and George, and I appreciate that he never treats the Indian character in a patronizing way. Heck, Eastwood even has fun with the usually somber portrayal of the natives. In one scene, Watie starts to lecture Wales about the plight of his people. Rather than give this scene ponderous reverence, Eastwood goes the other way: Josey falls asleep in the middle of Watie’s speech. It’s a nice poke at expectations, and the movie gets away with it because it shows such a warm relationship between the two characters. Really, it’d be hard to pinpoint any active negatives in Wales. The movie delivers a western with both heart and spirit that consistently satisfies. The Outlaw Josey Wales appears in an aspect ratio of approximately 2.40:1 on this Blu-ray Disc. Across the board, the image excelled. Sharpness appeared solid, as the movie was consistently distinct and accurate. The slightest hint of softness affected some wider shots, but those instances seemed very minor. Mostly the movie came across as tight and well defined. No issues with jagged edges or shimmering appeared, and I also witnessed no signs of edge enhancement. Print flaws stayed similarly unobtrusive. I noticed a speck or two but that was it, as the movie seemed nicely free from defects. Wales provided a rather natural palette – with a mild sepia feel - and the Blu-ray replicated these tones nicely. The colors often seemed to be somewhat subdued within that range, but they always looked accurate and rich. Black levels also appeared deep and dense, and shadow detail generally came across as appropriately heavy but not excessively thick. Across the board, I felt pleased with this presentation. I felt the film’s DTS-HD MA 5.1 also seemed terrific – surprisingly so, since the audio came from monaural sources. I’m disappointed the Blu-ray omits the original mono track, but I must admit I feel quite pleased with this remix, especially since it seems so organic; it’s hard to believe the movie didn’t always boast multi-channel audio, as the sound appears so smooth and well-integrated. The soundfield showed a forward emphasis but it offered a pretty well rounded affair in any case. The front spectrum provided a nicely broad and engaging display. Sounds were placed accurately in the environment, and they moved cleanly and smoothly across channels. The score also featured very good stereo separation. The surrounds mainly reinforced the forward spectrum. Some more distinctive effects also came from the surrounds, though these instances were more limited. Nonetheless, the movie’s louder sequences demonstrated an involving and active presence from all five channels, and they helped bring those scenes to life. Audio quality also appeared to be positive. Dialogue consistently sounded warm and natural, and I discerned no concerns related to intelligibility or edginess. The music showed solid fidelity. Highs seemed to be clear and bright, while the bass response appeared deep and rich. Effects also benefited from better than expected dynamics. They came across as clean and realistic, and very little distortion occurred. Overall, I found the soundtrack of Wales to provide a satisfying and exciting affair; it’s hard to believe this immersive, high-quality track came from a 35-year-old monaural source. A few extras flesh out the set. First comes an audio commentary with film critic/historian Richard Schickel. He delivers a running, screen-specific look at the source novel’s adaptation and the film’s development, cast and performances, story and characters, themes and interpretation, and reflections on Clint Eastwood and his career. Like virtually all Schickel commentaries, this one mixes insights with frustration. At his best, Schickel gives us a good take on the movie and Eastwood, and he throws in a few production notes along the way. But only a few; Schickel’s commentaries don’t tend to be heavy on facts and figures. I would be fine with that if Schickel didn’t let the discussion sag so much. He lapses into quite a few silences and also simply narrates the movie at times. You will learn something from this track, but you’ll not get a consistent discussion, so you may find its ups and downs bothersome. Two documentaries follow. Clint Eastwood’s West lasts 29 minutes, three seconds and provides remarks from Eastwood, filmmakers John Lee Hancock, Kevin Costner, Frank Darabont and James Mangold, film historian Sir Christopher Frayling, actor Morgan Freeman, producer David Valdes, author Neal King, editor Joel Cox, and writers George Gallo and David Webb Peoples. The show looks at Eastwood’s career in westerns, with a particular emphasis on his directorial efforts. “West” delivers an engaging examination of Eastwood and his work. 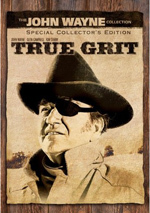 From 1999, Hell Hath No Fury: The Making of The Outlaw Josey Wales goes for 30 minutes, 29 seconds and features Eastwood, Cox.and actors Bill McKinney, Sam Bottoms, John Vernon, and Geraldine Keams. “Fury” examines the source novel and its adaptation for the screen, cast, characters and performances, visual design and locations, Eastwood’s work as director, music, and the film’s reception/legacy. Expect a nice overview here, as “Fury” provides a good recap of the production. In addition to the film’s trailer, we disc finishes with a vintage 1976 featurette called Eastwood in Action. It goes for seven minutes, 55 seconds and offers notes from Eastwood about the shoot. This is generally promotional material, but it includes some nice shots from the set and enough decent info to keep us with it for its short running time. For this release, the package comes in a hardcover book. It includes essays called “A Look Back” and “Clint Eastwood and the Western”, a biography for Eastwood, trivia, and photos. The book delivers some nice elements. No one will ever accuse me of being a big westerns guy, but if I saw more movies as good as The Outlaw Josey Wales, I could be converted. The film offers a neat combination of drama, action, comedy and heart to become a solid package. The Blu-ray boasts simply terrific picture and audio along with a generally positive set of supplements. This is a gorgeous release for a fine movie.